Eastern National operates museum stores at more than 150 units of the National Park Service, across 34 states, the District of Columbia, Puerto Rico, and the United States Virgin Islands. Each store is a reflection and an extension of the interpretive themes of its location, making each store unique. We work with more than 5,000 vendors to supply our stores with educational products that enhance visitor experiences, and develop custom merchandise that is specific to the sites we serve. We also partner with other federal, state, and local entities, such as the U.S. Forest Service, the U.S. Army Corps of Engineers, the state of North Carolina, the City of Parkers Crossroads, and the Robert Russa Moton Museum, and provide a variety of services based on our partners’ needs. Producing up to 100 custom publications per year, Eastern National works with our partners to produce high-quality products that are extensions of our sites’ educational and interpretive programs. They allow visitors to expand on the knowledge they gained while visiting, provide an in-depth look at a site’s theme or purpose, and help visitors take their experiences home with them. 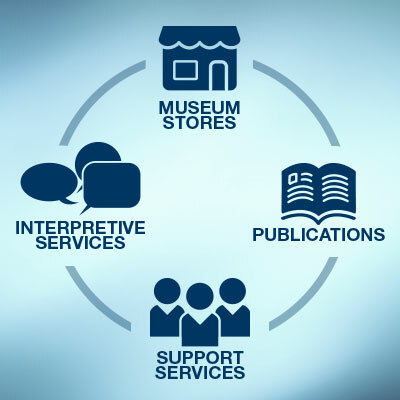 Eastern National provides a variety of services to our partners above and beyond our museum stores and publications program, including facility management, tours, and fee collection services. Contact us for more information, or to find out how partnering with Eastern National can streamline your operation.